Born in Manitoba in 1919, Allister grew up in Montreal. He is a professional painter and scriptwriter who has acted in Hollywood and lived in New York, Mexico and Montreal. He has recalled his two-and-a-half year ordeal as a prisoner-of-war in Kawasaki after the fall of Hong Kong in 1941 with Where Life and Death Hold Hands (Stoddart, 1989). Allister was one of 10,000 soldiers taken prisoner and held in harrowing conditions for four years. The book was inspired by a journey back to the sites of his imprisonment. It follows a first novel in 1961, A Handful of Rice (Stoddart), also about his POW experiences and precedes a new memoir, POW 325. He is the author of radio and television documentaries, film scripts and radio plays, including CBC's 1982 short story 'Krazy Krismas in Kawasaki', based on a POW Christmas. Allister has won nine international first prizes for documentary films. 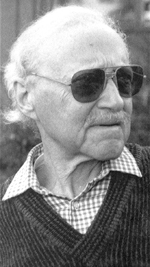 In 1986, he was presented with an Author's Award by the League for the Advancement of Canadian Letters. He had more than 20 one-man shows as a painter. The Art of Compassion, an hour-long documentary film on his life, was nationally on CBC-TV. A Handful of Rice has been translated into Dutch and Norwegian. Where Life and Death Holds Hands was published in Japanese in 2001 and won the Canadian Prime Minister's Award for the promotion of inter-cultural relations. He lives in Delta. [BCBW May 2003] "Art" "War"